These are suggested retail prices for aluminum flex pan window awnings, shutters and sunshades. 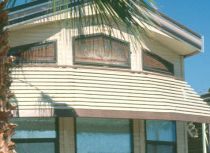 These window awnings are sold in kit form and do require installation. Most awning companies have professionals that do this but doing it yourself is not that difficult. You can see this type of window awning being installed here. This is a flex pan window awning on the front of a Park Model. The window awning is mitered to match the shape of the home. This type of install needs to ordered in three separate awnings plus some extra flex pans for filling in between the three sections.